LONDON, England (CNN) -- If treating heroin addicts by giving them heroin seems counterintuitive, having the government fund that addiction to the tune of more than $22,000 per patient per year comes across as downright radical. A newly released British study, however, found that daily heroin injections given to hard-to-treat addicts as part of a comprehensive program succeeded in treating those addicts and reducing crime. 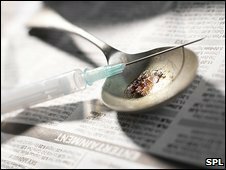 The use of street heroin was reduced by three quarters and the crimes committed trying to get drugs was cut by two thirds, the study found. "The intensity of the program is quite striking," said Professor John Strang, who led the research team at Britain's National Addiction Centre, associated with King's College in London. "The bond that is formed and the commitment that's established between the patient coming in for treatment and the staff is far greater than you would ever ordinarily see." Taking heroin off the streets seems to be making a difference. Researchers injected heroin in a safe, stable environment at medically supervised clinics. They crucially paired that with intensive counseling and addiction treatment. The researchers reported that benefits were evident just six weeks into treatment among users who had already tried and failed at other kinds of treatment. One of those participants was "Sarah," who said that after coping with her addiction for more than 20 years, she lost hope that anything would work. Sarah described how the program had an almost immediate affect on her life. She said she was able to keep a schedule, stop buying drugs on the street and gain an appreciation of what her life could be like if she wasn't so consumed by getting high. "You'll always be an addict basically; it's about managing it and leading a positive life" said Sarah, adding, "It quickly became, well, I actually do want to stop. I don't really want to have to stick needles in me all my life." Her biggest fear now is that the program will be cut or shut down if the government deems it too controversial. Another patient who asked to be identified as "Emma" told CNN, "The morality of it was taken out of the question. I wasn't being condemned for it and at last I could start taking responsibility in a rational way." Emma described being chaotic, confused, emaciated and always dreaming about her next fix. By contrast, she said, the program made her feel cared for, supported and, above all, confident that she could kick the heroin habit. "This thing that was the meaning of your life is becoming the thing that is getting in the way of your life and it becomes very unattractive," she said. Strang said the stubborn nature of heroin addiction is proof that getting addicts into treatment is really a shallow achievement because many will eventually turn to drugs again. He believes this promising approach could change the way hard-to-treat addicts are treated and convince the government that the initial high cost offers good value. "From the cost point of view, if you actually look at the bigger picture, cheap treatment isn't always good treatment. If cheap treatment doesn't deliver any benefit then it's particularity bad value," Strang said. The reduction in crime found by the study mirrors results in a handful of studies in other countries. The treatment is relatively expensive, about $22,000 per patient, per year. But in Britain many are coming to terms with the fact that keeping a person in prison can cost three times more than that. If the encouraging results continue, Britain could one day set up permanent clinics around the country, dispensing heroin for its most hard-to-treat addicts. The British studies are certainly positive, but if anything they are a box ticking exercise. Its well demonstrated that maintenance prescription is beneficial, but politicians are too scared to simply roll the program out without doing a trial run. Lets hope the next government doesn't quietly shelve it in a wave of anti-drugs rhetoric. A scheme in which heroin is given to addicts in supervised clinics has led to big reductions in the use of street drugs and crime, the BBC has learned. More than 100 users took part in the pilot - part funded by the government - in London, Brighton and Darlington. The Randomised Injecting Opioid Treatment Trial (RIOTT) programme - which is funded by a number of agencies, including the Department of Health - began in 2005. It involved 127 chronic heroin addicts for whom conventional types of treatment had failed. Many participants "substantially" reduced their use of street drugs. Medical heroin may be the most effective treatment for treating opioid addiction, according to an American study. When former users were treated with diacetylmorphine, the active ingredient in heroin, there was a 67 per cent reduction in illegal activity and illicit drug use after one year of treatment, compared to a 47.7 percent reduction with the treatment methadone. The study, which was carried out at the University of British Columbia School of Population and Public Health in Vancouver, also found that retention rates in treatment programmes were higher for patients receiving diacetylmorphine - 87.8 per cent of patients taking diacetylmorphine were still enrolled on a programme after one year, compared to 54.1 percent who didn’t take it. Dr. Martin Schechter, who carried out the research, said that diacetylmorphine was an effective alternative to methadone for patients who have failed to respond to previous treatment. He believes that methadone should remain the standard treatment for most patients with opioid dependence, with diacetylmorphine reserved for the 15 percent to 25 percent who don’t respond. Dr. Joshua Lee, from New York University, said the findings complement similar studies carried out in Europe - that medical heroin is a valid approach to treating addiction. However there are some critics to the use of diacetylmorphine and methadone as viable treatment options. Dr. Daniel Angres, psychiatrist and author of Healing the Healer: The Addicted Physician believes that alternatives such as bupronorphine should be more openly available. Dr. Daniel Angres, psychiatrist and author of Healing the Healer: The Addicted Physician, questioned the usefulness of both diacetylmorphine and methadone as treatment options when an alternative with less abuse potential, bupronorphine, is available as the drug is less likely to be abused and the naloxone would block the opiate effect of bupronorphine if the drug were injected. Adding these articles as swim was interested in the research, and apologises if anyone is annoyed they are a little old. Still quite hard to get excited about though. They've been doing studies into this for decades, and, unsurprisingly, every study has shown it to be beneficial to both the addict and society. Yet it's still to be available to any but the select few lucky guineapigs. To swim's knowledge, the last clinic in the UK prescribing diamorphine, (and cocaine/crack incidentally), was in Widnes in the NW of England. I believe several people attending the clinic actually committed suicide after it's closure. The benefits of this method are pretty clear and obvious to anyone of relative intelligence. The real issues with it lie in it's morality (unfortunately). The general public, i.e. the voters, have no experience of addiction to any hard drug, and as such, the majority honestly believe that they would never get into that situation, and if they did, they would be able to quit, as they are strong enough to. The general belief is that addicts simply aren't trying hard enough, and that, no matter what, their lives would be better without drugs, and as such, their treatment should be solely abstinence based. To anyone who knows about addiction, they'll know that simply saying, 'don't do it' isn't always successful,-or possible. However, until the general public change their opinions on the matter, it simply won't get beyond the trial stage, as it's just too high-risk for the government. Every decision a government makes has to be 'softened' so as to never alienate too many voters. Even if in both the short and long-term, the policy, (like this one), would drastically reduce crime, reduce the cost to the taxpayer, devastate organised criminals' funding, and, so so so f**king importantly, save lives!!!! There have been studies using numerous different opioids, obviously heroin being the most successful. The slight problem is, of course, that it still involves needles. A friend of mine (now dead) told me that for some years in the mid-80s there was a study using Diconal. It proved almost as successful as diamorphine. They had to go twice a day and swallow tablets in front of staff. Now, The 2 active ingredients (Dipipanone and cyclizine) could just as easily be but into a linctus to be taken home. -Optically purify the dipipanone (or alcohol analog) so that the patient is only taking the most active isomer (less toxic). -Use the N-ethyl isomer of cyclizine (increased T1/2). Cyclizine has fewer negative effects than methadone (sleepiness, tooth decay and so on) AND gives a better high so patients are likely to stay on the program. After all, stability and safety are very important.